ALTERNATIVE: Arrival and meeting at the airport. Transfer to the hotel in Izmir .Half day sightseeing tour. Accommodation at the hotel in Izmir. Breakfast . Leave the hotel. Visit the ancient city of Pergamon, a great center of culture: Asclepion (sanctuary dedicated to the god of health, Asclepios), Library, Royal Palaces, temples of Trajan and Dionysos, the steepest theatre of the world, the altar of Zeus (also known as the Seat of Satan). Arrive in Izmir (city tour if possible). Proceed to Selcuk. Arrive at the hotel in Selcuk. Dinner and overnight at the hotel. Breakfast .Visit the Archeological Museum that houses an impressive collection of works recovered during the excavations in Ephesus, Ephesus, the grandest and best preserved of the hundreds of ancient cities and classical ruins in Turkey, Temple of Artemis, one of the Seven Wonders of the World, The Grotto of the Seven Sleepers, The Shrine of Virgin Mary, the house where Virgin Mary has spent her last days and has now received the official sanction of the Vatican. Visit the small town of Sirince, which is famous for its wine and renovated 19th century houses. Arrive in Kusadasi, an attractive holiday spot. Free time (shopping, swimming) . Arrive at the hotel in Selcuk (dinner included). Overnight at the hotel. Breakfast. Drive to Pamukkale, a very stunning place, famous for it's natural beauty. 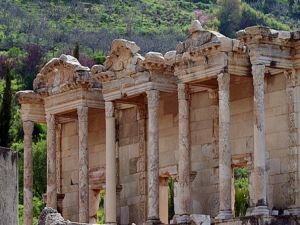 On route Pamukkale, you will be visiting antique cities of Nysia and Aphrodisias. Upon arrival, check in at the hotel. Dinner and overnight at the hotel. Breakfast. After visiting Karahayit, a town famous for it's reddish thermal water, Hierapolis, an antique city built to honour Hiera; the beautiful wife of Pergamon King, you will be witnessing a spectacularscene, the travertens. Dinner and overnight at the hotel. Breakfast. Check out from the hotel. Drive to Isparta. Lunch break. Arrival in Isparta. Drive to the Isparta Crater Lake. Take a walk at around the lake. Drive to the city center. Visit the Isparta Museum. Free time for shopping. Drive to Egirdir. Arrival at the lake side hotel. Dinner and overnight at the hotel. Breakfast. Full day tour. Dundar Bey Medresesi, Hizir Bey Mosque, Egirdir Castle , Kemerli Minaret, Kovada Lake and the Kovada National Park, Karaca Oren Dam, Yazili Canyon, Natural Park, Adada Antique City, King's Road are the places to be visited. Dinner and overnight at the hotel. Breakfast. Check out from the hotel. Drive to Yalvac. En route, visit Ertokus Caravanserai , Yalvac Museum, Psidia Antiochia Antique City , Saint Paul Church. Drive to Konya. Arrival in Konya. Dinner and overnight at the hotel. Breakfast. After checking out from the hotel, visit Mevlana Museum and Tomb.Transfer to the Konya Airport to catch the domestic flight to Istanbul. From Istanbul, fly to your home country.